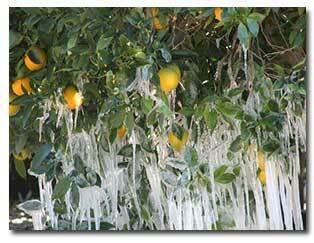 It’s January and the possibility of coming frost is very real, even in our milder climate, where many gardeners enjoy having citrus trees in their landscape. Make sure plants are well-watered. Harvest any fruit that is ripe. Unripened citrus is not like unripened tomatoes; it will not mature after being picked. Just leave unripened fruit on the tree. For citrus trees under three years old, wrap a thick insulating material such as Burlap Sheets or Dewitt® N-Sulate Blankets around the tree trunk. If the citrus plant is in a container, move it to an area that shelters it from the wind. Against a sunny, south- or west-facing brick wall is ideal, as the brick absorbs heat during the day and releases it when the sun goes down. Pull aside any existing mulch. The warm soil will send heat back up through the tree. Make it a festive citrus: hang a string of the larger-bulbed Christmas lights in the central area of the tree to add a few degrees of warmth. Cover plants with burlap, row cover fabric or cloth sheets, but be sure to remove them during the day. By keeping your citrus warm and protected during the winter months, you can ensure they don’t go from tart to toast.